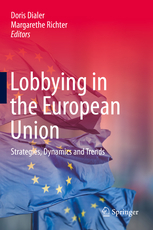 Having set up and run for the past 10 years a leading Brussels-based observatory of EU politics, Doru Frantescu, CEO and Co-founder of VoteWatch Europe, shares his insights in this Springer’s book, Lobbying in the European Union. The volume is coordinated by Doris Dialer and Margarethe Richter and combines insights from a broad range of practitioners and academia. The chapter which Frantescu co-authors digs into the channels that we can expect the UK to use in order to defend British interests in Brussels after its own officials leave the European Parliament and the Council. The book can be ordered in different formats (as e-book and hardcover) by accessing the following link.